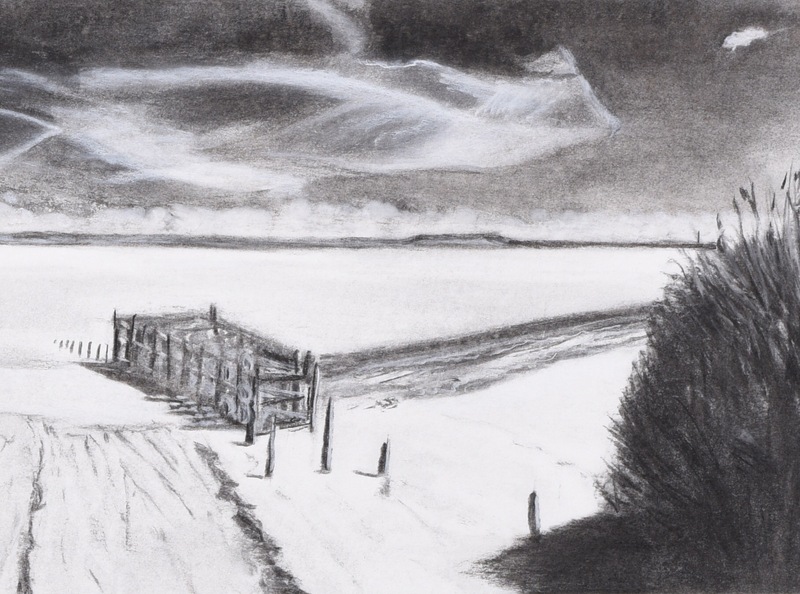 Below is part of a digital photo of an original panoramic view, with the bridge under the rail line showing THE STANDING STONE on STROAT FARM LAND executed in Charcoal, chalk, pastels, watercolour & ink by Carolyn Black. I’m working on new drawings constantly, mostly depicting places either side of the River Severn in Gloucestershire. Read about the historical context of how these works have evolved, over some 20 years, here. These are black & white photos of original works and, as such, are different to the actual drawings. To view them larger, click on images and they will open a new page. To gain a sense of scale, go here. They all measure approximately 75cm x 25cm. The images shown are photos of the original work where stated (mostly in frames or in context). They have a wider tonal range and are more subtle than black and white digital. Due to the large scale of the originals, they are better represented in this way. Others are black & white digital prints, photographs of the original artworks modified for editioning, not the actual artworks.